Gruyere Reserve is renowned on the Paxton & Whitfield counter as being one of the most consistent cheeses that we stock. As a general rule, cheesemongers enjoy working with cheese for exactly the opposite reason - cheese has a vintage, but it's not yearly; it's daily! 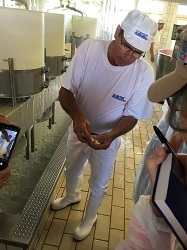 Climate, feed, season, weather and even individual cheesemakers within one dairy will lead to variations in a cheese which, although minute at the time of production, can lead to bigger variations on maturation. However as one of London's leading wholesale cheese suppliers, we know that many chefs, whilst enjoying the romantic idea of batch variation, actually yearn for a really fantastic consistent product! It is undoubtedly useful to know exactly how much cheese you will need to produce the best fondue, soufflé or sauce, as well as knowing just how it will sit with other cheeses on the board. 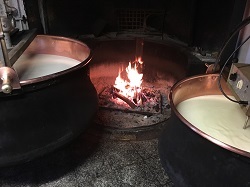 What is incredible about this consistency, as Trade Manager Ruth learned on a recent trip to Switzerland, is that Gruyere is not by any means an industrial or factory-made product. 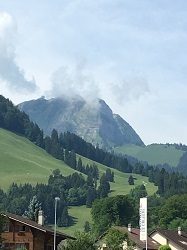 The tonnage produced by the cheesemakers who make Gruyere is substantial but the dairies that make it are very small and situated in villages scattered around the region. Indeed they are so small you would often think they are houses. The milk is delivered twice a day by farmers who travel a maximum of 20km from their local dairy and have between 20 and 60 milking cows. The consistency is therefore not down to all Gruyere being made by large dairies - far from it. It is down to the rigorous production standards and quality control put in place by the Gruyere consortium who are passionate about preserving the excellence of this mighty and historical cheese. They know that the day a sub-standard Gruyere gets into the market is the day the name of Gruyere starts to be eroded. In contrast, Gruyere Alpage is made in such a way that celebrates the difference between the tiny mountain dairies. This cheese is made entirely by hand in copper vats that are stirred over open wood fires, with the cows grazing on wild flowers and grasses particular to that farm. 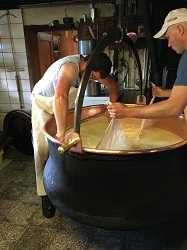 The wheels are stored in cellars and brushed by hand meaning that are a hundred ways in which each cheese can differ. 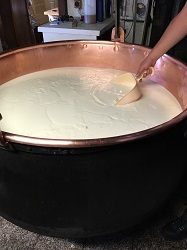 Every wheel is tested for quality by an independent expert from Le Gruyere AOP so that you can be sure your Gruyere Alpage has amazing complexity and flavour but you also can expect variations in taste every time. We deliver wholesale six days a week within London and in addition to our store in Jermyn Street we have shops in Bath, Stratford-upon-Avon and Chelsea who can offer advice on cheese selection and fulfil orders - including specialist advice on local or regional cheeses. We also send via overnight courier to most areas in the UK. If you are a current trade customer and would like staff training about any aspect of cheese please get in touch.